Adding printers to a network either means buying them with networking built in, which is expensive, or using a printer server to give non-networked printers network access. D-Link's DPR-1260 enables up to four standard USB printers (or all-in-ones, if you choose) to be networked just as if they were connected to USB ports on the back of a PC. It's a PDA-sized box with a Wi-Fi aerial, Ethernet port and four USB sockets on the back and status lights for power, network, wireless and printer availability on the front. Setup is a messy affair at best, not made any simpler by the sketchy Quick Install Guide. In the first stage, you disconnect one of the PCs from your network and connect it instead to the DPR-1260, with the supplied cable. The PC has to be set to an IP address within the print server's range. 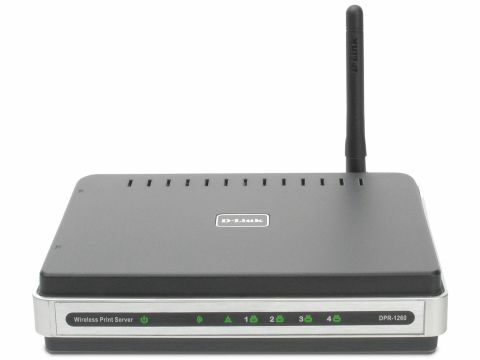 Once you've got into its firmware, you can reset the server address to fit with your network's address, and give it details of your wireless connection. The network cable can then be disconnected and the print server connects wirelessly. To install a printer, plug it into one of the four USB ports on the back of the DPR-1260 and run through the server setup wizard using any Internet browser. The firmware needs access to the printer setup CD, so it can install the printer driver and set it to use a TCP/IP port. You have to do this on each PC and for each printer you want to use, but it's a once-only configuration. Each printer has a separate driver on each PC and, when everything's running, you can steer documents to any device on the print server. Scanning from an all-in-one is dealt with through the firmware again and is more basic than most OEM, all-inone software. You have to move to the scanner to load the original, and back to your PC to start the scan, too. Once you've worked through the convoluted setup procedure, the DPR-1260 does what it says. You can print to and scan from devices connected to it over an 802.11b/g link. Assuming you want to huddle printers together in a printer farm, which is not always convenient, this is still an expensive solution - wireless print servers start at around £40.